On Sunday, my creative mojo returned. To me, the mojo is the urge to create. It’s what helps me make sewing and knitting the top priority. Up until now, I’ve been doing a lot of daydreaming about sewing but not taking any action (extenuating circumstances and all that, but still). But now, the urge is back. And so on Sunday I looked through the pre-fall offerings at Neiman Marcus, pre-fall and fall shows at Style.com, and new patterns on Ravelry. It was on Ravelry that I found Viajante – a very interesting ponchoid shawl. It goes over the head, which means it stays put. And it has a long tail which can be left dangling or wrapped around the shoulder. I plan to wear it wrapped and held in place with a shawl pin. It can also be used as a regular shawl, wrapped around the shoulders, but I find the over-the-head aspect much more intriguing. 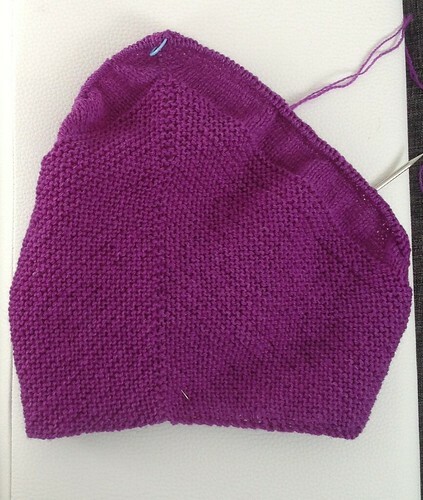 My stash may be severely diminished, but I did recall a lovely purple lace-weight yarn from Brown Sheep. Luckily, it had escaped the great purge. After a bit of fighting to get it wound into cakes, I sat down to knitting. And that was all she wrote. I only went to bed because I had a hard time seeing the stitches anymore. I continued working on the shawl today, stopping only to attend to basic needs (husband’s and mine). And to look at everybody’s SWAP pictures. Oh my, what a lot of inspiration! Beautiful garments and great combinations… There were so many times that I thought to myself “ooh, I want one of those”. And then it came to me. I had been lurking on the summer 6-PAC thread but could not come up with a reasonable 6-PAC to attempt. But now I had it – I need clothes that are nice, will withstand the demands of a busy travel schedule and attending to household matters, and must be washable as well. For the bottoms, I’m looking at cotton twill (pants) and cotton canvas or pique (skirt). For the dress, Sophia knit. I already have these fabrics. I do not, however, have fabrics for the tops (which will have 3/4 sleeves but I couldn’t find better pictures) and cardigan. I hope to find those soon. That’s it, I’m off to do some more knitting. This entry was posted in knitting, wardrobe planning. Bookmark the permalink.